Boots for riding your snow machine may not be something that you’ve thought about a lot. But you need to get these right for protection and comfort in the cold. If you’re looking for a good pair, we’ve reviewed a few that may be worth trying. There’s a wide range of great boots in the market, each featuring a wealth of insulating and water resistant properties in well-designed bodies. We’ve assembled this guide to the best snowmobile boots that you can use to compare between models. **Below, you'll find my more detailed reviews about the snowmobile boots, but you can also click the links above to see current prices or read customer reviews on Amazon. 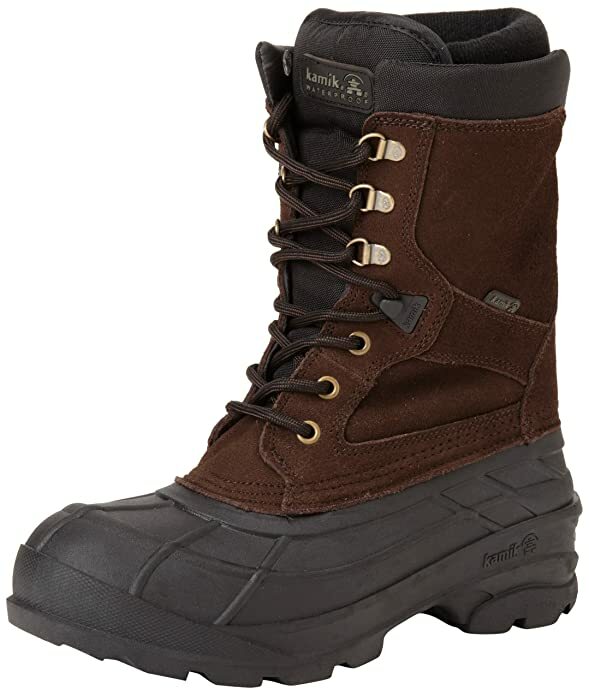 These are lightweight boots with supple interior liners inside waterproof outer shells. Pac boots offer great warmth due to the superior insulating properties of the inner ‘booties’. Many are waterproofed with external rubber or leather materials. These are generally well-regarded for comfort as well as protection from winter cold. The use of interior liners lends to a slightly looser fitting, and these are normally less easy to walk in than single-layered boots. But for quick outdoor rides, these can be convenient. These designs do not employ lacing, and typically have tabs or handles that are used for pulling them on. Made of a variety of materials from leather to rubber to textiles, these come with or without insulating liners. They offer differing levels of waterproofing and comfort but generally emphasize conveniences over performance. Hiking or mountain boots are of heavier construction, with midsoles optimized for long-distance walking. We’re not covering these since we’re focusing on footwear for snowmobile use. Your feet must be kept warm in cold temperatures, and a mix of insulating liners and outer shells and soles work together to provide protection and comfort. Neoprene does not compress and lose its capacity for insulation, although with tight-fitting designs your feet might feel clammy if they can’t breathe well. It’s durable but doesn’t retain warmth as well as other materials, thus it’s best suited for use in more temperate climes and moderate weather. Insulation comprised of synthetic fibers are integrated into liners. These trap and retain heat better when their loft expands, bringing cushy softness but also a looser-fitting feel. These can feel softer than neoprene, but become relatively less effective once they’re soaked. Materials like rubbers or leathers are intrinsically water resistant, but waterproofing membranes can also be layered in. Totally waterproofed layers that keep water out tend to be breathable, though. And soaked fabric hinders the escape of foot perspiration, which can lead to a damp and cold feeling. Here’s a list of boot that will keep your feet warm, dry, and secure in most winter terrain. This pair of rubber boots is made for slippery surfaces both indoors and out. It does not retain warmth as well as others , but waterproofing, comfort, and ease are second to none. Each boot is lasted by hand, which is essential as the rubber outer shells and inner neoprene booties cannot shape to your feet unlike leather models. Soles are formed of fully waterproof rubber that’s designed for optimal traction in the wet, with lug patterns that grip well in mud. The snug fit is comfortable for long walks about town. The big handles are great for quickly pulling the outer boots off, and the stretchy neoprene booties lining insides will accommodate thickly-piled socks. It’s easy to slide your feet through the uppers’ broad openings, but the wide entry also lets spraying water in more readily. 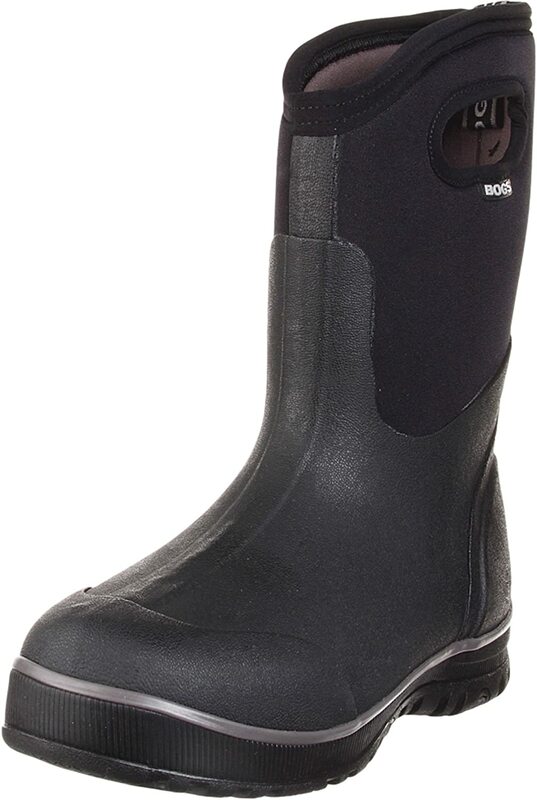 Bogs’s Classic Ultra Mid is affordably priced and offers outstanding waterproofing, fit, and convenience, requiring little beyond the need to dry its insides. These are the best snowmobile shoes for use in more temperate climes. This an inexpensive all-around pair that offers dependable performance. It gets really warm, as the lining loosely maintains its loft to better trap heat. Comfort-rated to -40 degrees, this is pair to put on if you’re sledding Northwest upcountry. These boots are good to go with either the laces undone or stuck into lining. It’s also easy to put your foot through its wide opening and gusset. Tying it all down can be little tricky with its speed eyelets and locks to hold the lower laces. The uppers are constructed of thick suede, with a single molded rubber piece forming both outsole and sole. The lug patterns get a good grip on flat ground, although not as much in mud and snow. High water can readily enter from the top or via the gusset and wet the Thinsulate foam, causing the lining to become mushy and cold. The liner does remain cozily in place and fits better than that of most other boots. It also traps heat well, keeping your toes warm even after long rides in the snow. Among the most inexpensive models, Kamik’s NationPlus performs well given its reasonably low price. Its great design and very warm and comfortable fit has made it our budget pick for use in all but the wettest weather. These boots retain warmth well and offer excellent protection from the elements. These are among the lightest yet warmest pairs we’ve ever enjoyed , and if you suffer from the cold you'll likely enjoy these. Synthetic ‘fur’ on the cuffs and close-fitting heel cups provide for a cozy feel. Although waterproofing membranes keep water out while letting sweat and let moisture escape, you can’t simply ford deep water with these on. The insulation can still get wet and at the seams and spread the cold. Otherwise, your feet will not sweat too much in these, no matter how warm they get. The high gusset design lets you lace up fully or else just slip the boots on for a quick supply run. This was not the most comfortable pair we’ve tested, and the soles didn’t handle slippery ground as well as others. Do be aware that Salomon's footwear sizing tends to run big. Salomon’s Toundras are expensive, but they are warm, fit well, and are good for wide-footed riders for whom finding a good pair can be challenging. 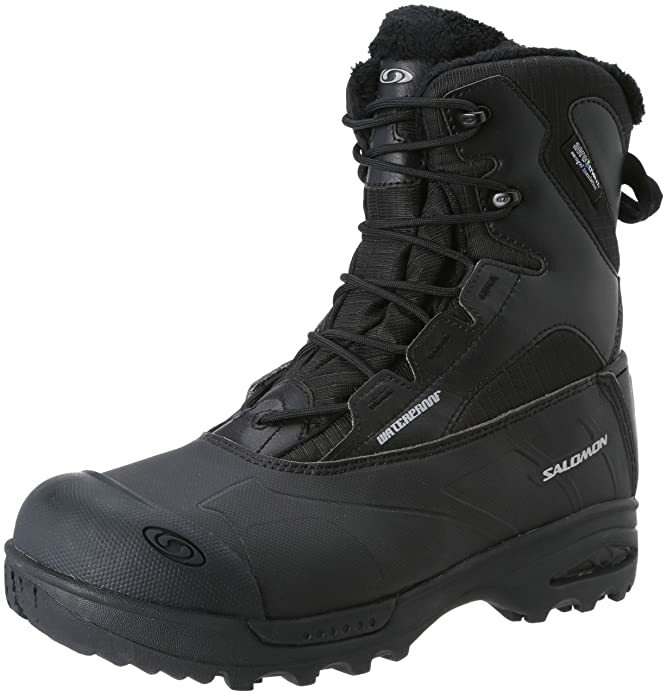 These are quality all-around boots that will keep you very warm are great choices for riding snowy backcountry all day. 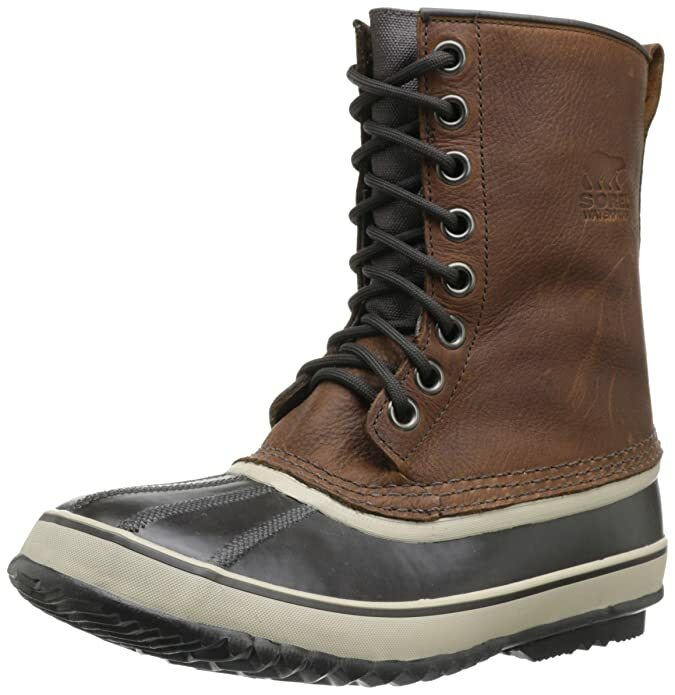 These Sorels epitomise classic winter boot styling that can be laced up or used more like slip-ons. They’re comfortable and easy to put on, although not as warm as some others. The vulcanized-rubber outsoles are sewn to leather bodies. The traditional felt lining packs down after a while, with little other than the rubber bottom to insulate against the cold ground. The tongue tends to let some water in when walking through deep water. The classic design is popular because it’s so effective and convenient. You pull on the tabs on the outers and the pac liners to quickly remove the boots. You can just tuck in the laces for a fast firewood run, or tighten them up for a more serious trip to town. The quality of the construction is good and the full-grain leather uppers are supple and smooth. Tucking in your cuffs into their tops won’t be too hard, and the soles’ herringbone treads worked fine on slippery asphalt. After some time on your feet, you might find them less comfortable due to the loose fit and the absence of insoles. Sorel’s 1964 Premium T boots are great for use in mild winter, especially for quick rides around resorts. They are a sensible pick for all but the wettest and coldest runs. Finding a good pair of snowmobile boots can be a bit of a job. You’ll not only have to keep your toes dry and toasty, you’ll also want to keep water out and let your feet breathe for more comfort in the field. We’re fortunate to have so many great models to choose from that are designed to meet the needs of different users. We’ve picked the Bogs Classic Ultra Mid as the best snowmobile boots for all-around in all but the harshest weather. The Kamik NationPlus is our budget pick for use in all but the wettest conditions. Be sure to choose one that can keep your feet warm and dry in the kind of terrain and weather you expect to face. If you liked our guide to the best snowmobile boots, please leave a comment and let us know what you think!